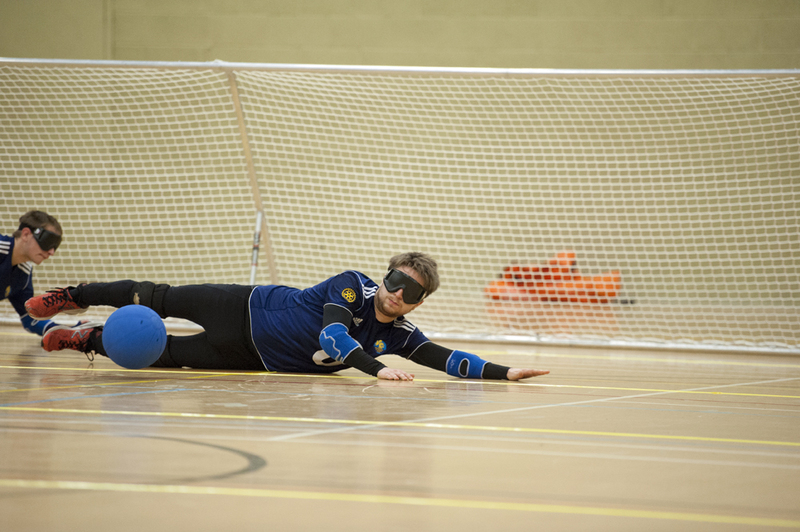 Within Goalball these three words are used interchangeably and all describe the ‘act’ of trying to score a goal. 3. 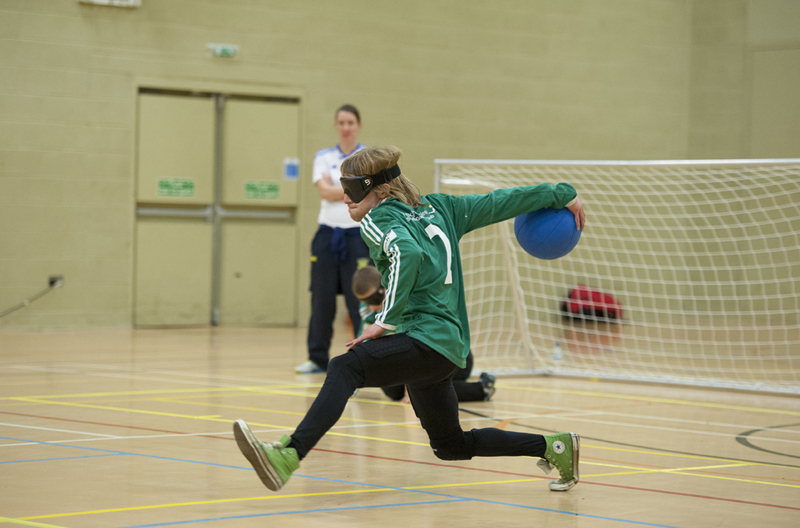 Step forward (with one leg) The leg opposite the hand holding the ball should be placed out in front of the body. Both feet should point in the general direction that the ball is to be thrown in. 4. 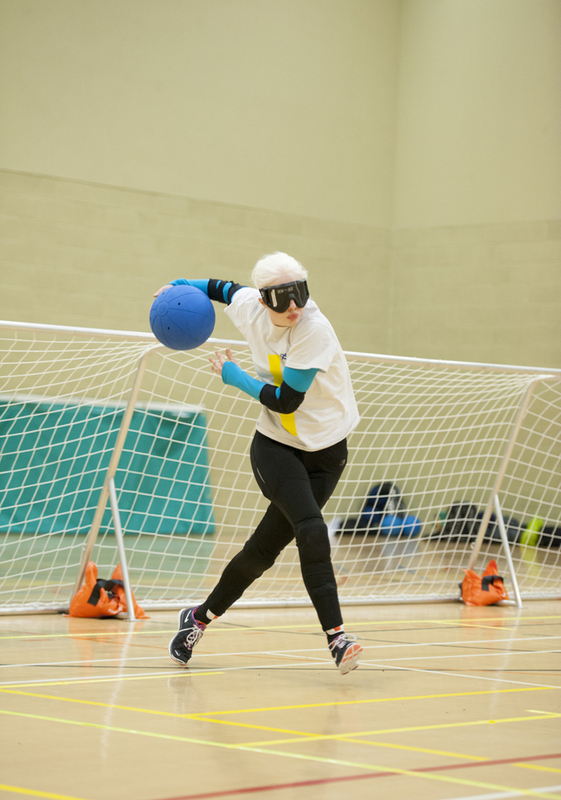 Take the ball backwards The hand and arm containing the ball should be taken as far back as possible, without dropping the ball.The supporting hand should withdraw once the ball begins to go backwards.N.B. If an individual has difficulty in doing this, e.g. a child with small hands, then the hand can follow in support. 5. Bring the ball forward and release The hand and arm containing the ball should come forwards as soon as the peak of the backswing has been reached. Both knees should begin to bend as the ball comes forward to the point of release. 6. Follow through with the throwing arm After releasing the ball the throwing arm should continue to follow through. This is very much like a very simple ten-pin bowling action. To progress from this and in order to throw faster the player can build up to taking three or more steps before releasing the ball. 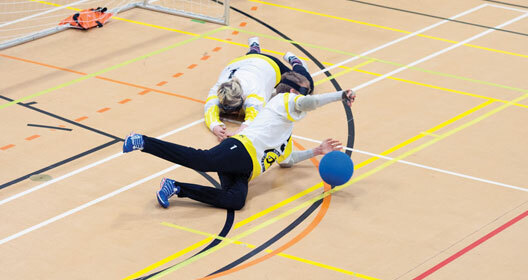 All three players in a team have defensive responsibilities and must try to stop the ball going over their goal line as it comes towards them. The recommended one to start with is crouching on the toes with the fingers just resting along one of the lines of the court. This allows a quick transfer to the ‘barrier position’. All players need to be able to defend. With experience players learn to tell where the ball is coming from and where it is going to and they have to respond by putting themselves between the ball and the goal they are defending. It is usual for the centre player to play the major part in defence with the two wing players playing a supporting role. One way of teaching the straight defensive position of the body is to lie face down with the arms stretched out in front palms downwards, legs stretched out behind and simply roll onto the side while maintaining the relationship between the hands, body and legs.